Setting up a Twitter business account is so easy that practically anyone can do it. However, instead of just going through the basic steps and calling it a day, you’ll want to spend some time optimizing your profile. This increases the likelihood of gathering lots of dedicated followers, as well as your chances of showing up in relevant searches. In this post, we’re going to start by talking briefly about the importance of Twitter as a platform. Then we’ll explore five simple ways to optimize your Twitter business account right away. It can be easy to look at rising stars such as Instagram and assume Twitter has had its day in the sun. However, this couldn’t be further from the truth. Twitter is still the fourth most popular English language social media network, boasting around 330 million active users. 79% of Twitter users are international, meaning you can reach a truly global audience. Ad engagement has been increasing rapidly on the platform, making Twitter an excellent place for marketing. Over 68% of Twitter users have purchased something from a small business because of Twitter, and around 93% plan to do so in the future. In other words, Twitter can be effective at increasing your conversions. These are some impressive potential benefits. On the other hand, you aren’t likely to see them if you don’t take the time to put your Twitter business account together carefully. In the past, we’ve discussed the importance of developing a clear overall marketing strategy for the platform. The first step toward doing so effectively is to optimize your account. Fortunately, creating a Twitter account that produces results isn’t difficult. All it takes is a little time and effort, as well as some knowledge about which elements are most vital. Let’s take a look at the most important strategies, one at a time. This first step is the simplest, and may appear obvious at first glance. However, you might be surprised at how many users never fully complete their Twitter profiles. Adding in every basic detail about your company means visitors will have the information they need, right at their fingertips. A bio. This should be a short blurb introducing your company to those with no knowledge of you. You’ll want to make it clear what your business does, and how it can benefit customers or clients. For bonus points, you may want to work in an important keyword to assist with Search Engine Optimization (SEO) – but only if you can incorporate it naturally. Also, be sure your bio adheres to your company’s tone and style. Location. Of course, this is important if your business has a physical location. However, it’s a good idea to let people know where you operate regardless. Letting people know where you’re based can help give your business a ‘human element’. Website. Finally, this may be the most crucial piece of information on your Twitter profile. You’ll want to funnel as many people back to your website as possible – to inform them about your offerings and expose them to further marketing – so don’t leave this field blank! Once you have these basics out of the way, it’s time to have a little fun with your Twitter business account. Maintaining consistent branding across your entire online presence is vital. For one thing, it will make your business more recognizable and memorable. Plus, the importance of strong imagery for getting people’s attention and making your message ‘stick’ can’t be overstated. Your header image. This comes first for a reason. It’s the banner displayed across the top of your profile, and as such largely defines the look of your Twitter page. You’ll want to use an image that takes up as much of the allotted space as possible. Using a photo of your location or team members is a great idea since it will help to personalize your page. In addition, you’ll need to create the image at 1500×500 pixels. However, make sure it looks good at a 2:1 ratio as well, since this is what it’s resized to on mobile devices. Your profile photo. This is the smaller image on the left side of your profile’s header. For individual Twitter users, this is often a picture of the person who owns the account, and the approach can work well if you’re a one-man shop. Otherwise, it’s usually best to add your company logo here, or some other simple yet memorable image. Either way, it should be set at 400×400 pixels, and should still look clear and recognizable when scaled down. With those two elements taken care of, your front-facing Twitter business account should be looking good. Next, let’s examine some behind-the-scenes options. Even if you’ve been using Twitter for a while, you may not have spent much time in your account settings. It can be easy to get hung up focusing on what the front end looks like, but you may also want to tweak a few things about the way your account works. 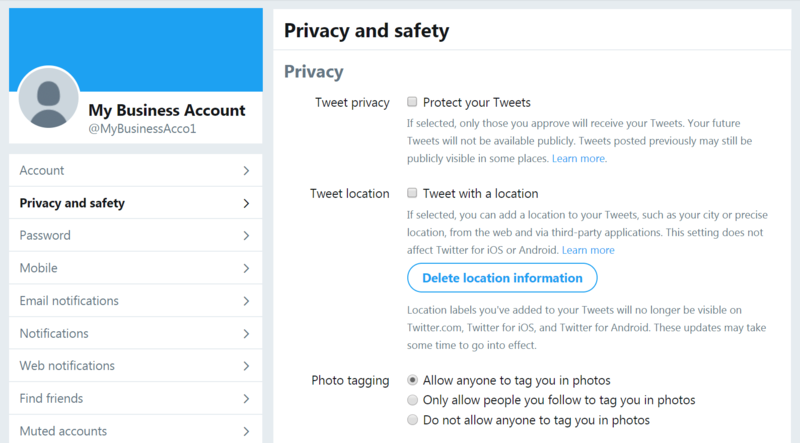 If you head to your profile’s Settings and privacy section, you’ll find a lot of options. Privacy and safety. You’ll want to enable all of the Discoverability options, so people can find you using your email address and phone number. Of course, make sure your company’s information is on file – not your personal contact information. In addition, you’ll probably want to turn on the Direct Messages setting to let your target audience contact you easily. Email notifications. It’s best to have as many notifications turned on as possible here. People expect a quick response when they communicate with a business through Twitter, so you’ll want to know of new messages immediately. On the other hand, you’ll probably want to disable most of the options under Updates from Twitter, in order to cut down on junk emails. Find friends. Here, you can upload the contacts from your email address book. This makes it easy to quickly connect your profile with your existing clients, partners, and other important people. Accessibility. In this section, you can turn on Image descriptions. This lets you add a little information to each of your images, in order to help visitors who happen to be visually impaired to better understand your content. Once you’re happy, don’t forget to save your changes, then move on to our next optimization tip. If you’ve spent time on Twitter, you’re probably familiar with ‘pinned tweets’. This is a specific tweet set to be fixed at the top of a Twitter profile, even if it isn’t the latest message. With that, your tweet will be featured at the top of your Twitter business account until you either unpin it or pin a different message. You can only have one tweet pinned at a time and it has to be a message you sent (i.e. not a ‘retweet’). Highlighting your most recent blog post, so none of your followers will miss it. Spotlighting important company news, such as the announcement of a new product. Drawing visitors’ attention to time-sensitive information, such as details about a specific promotion or campaign. It’s generally a smart idea to keep a tweet like this pinned to your profile at all times. The opportunity to customize the first thing people see when they land on your Twitter business account is just too good to pass up. Just make sure to change out the pinned tweet every so often, so your profile can remain current. Finally, let’s talk about Twitter ‘lists’. This is one of the platform’s lesser-known features, but one that can be used to add extra value to your Twitter business account. A list in this context is simply a collection of Twitter accounts. You can see them by clicking on Lists right underneath any profile’s header image. You can build any many lists as you like, add an unlimited number of profiles to them, and make them publicly viewable or private. This affords you a lot of flexibility. Create public, curated lists for the benefit of your followers. This is a smart way to provide visitors to your account with something of value. You can collect the profiles of experts in your industry, for example, offering your audience suggestions about who else to follow (besides you, of course!). Put together a private list for internal use. One of the most common applications for a private list is to gather together the profiles of all your main competitors. Then you can keep an eye on what they’re up to, without sending your own followers their way. That’s it! You can continue to add more profiles as needed. A side benefit of doing this is that people and businesses will be able to see when you’ve added them to one of your public lists – hopefully encouraging them to follow you in return. Creating a Twitter profile couldn’t be easier. However, this can lead to complacency when it comes to your Twitter business account. Simply slapping together a profile in a few minutes means you’ll likely end up wasting a lot of its potential. Are there any other tips you want to share about how to create a strong Twitter business account? Share them with us in the comments section below! 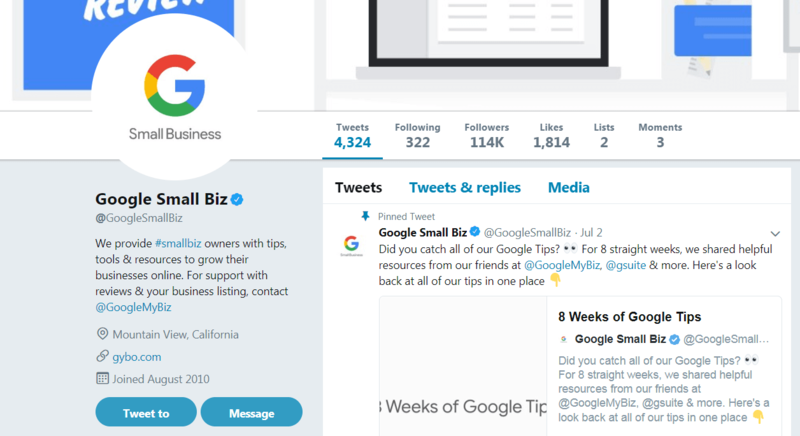 The post How to Optimize Your Twitter Business Account in 5 Simple Steps appeared first on Revive Social.